HUMAN Costume designer art, a single sheet of paper. IDENTICAL MORTALITY Striking and unique designs achieved as a result of using a material that behaves and flows very differently to cloth. Hand painted Japanese Washi paper. Human Collection: costume designer art, a single sheet of paper. RABBIT ISLAND Kojima wanted to make costume designs that challenged traditional methods of fashion and worn art by using her own process – based on the principles of Japanese Kirie which requires only a single sheet of paper to be utilised to create a finished piece. IDENTICAL MORTALITY Narrative running through the pieces turns the wearer into an integral part of the art. 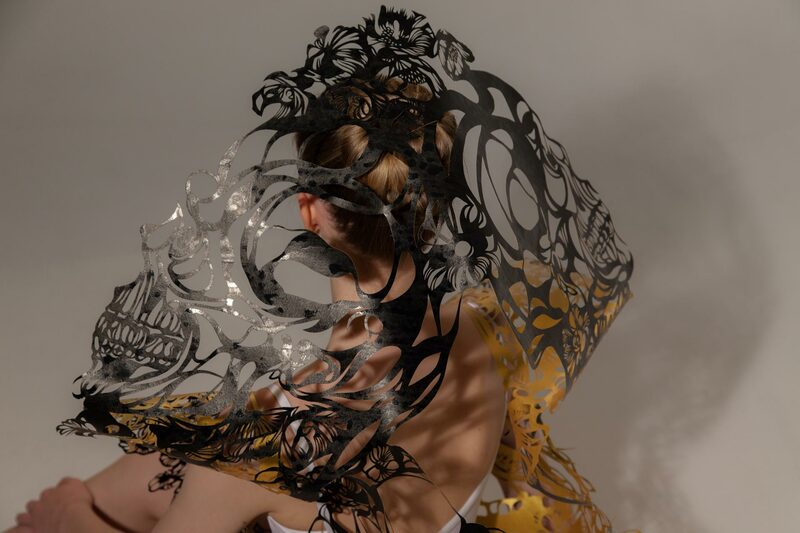 Human Collection: costume designer art from a single sheet of paper. BEAUTIFUL THINGS The 6 piece collection sees pieces draped on shoulders, worn as a gown and also around the neck. 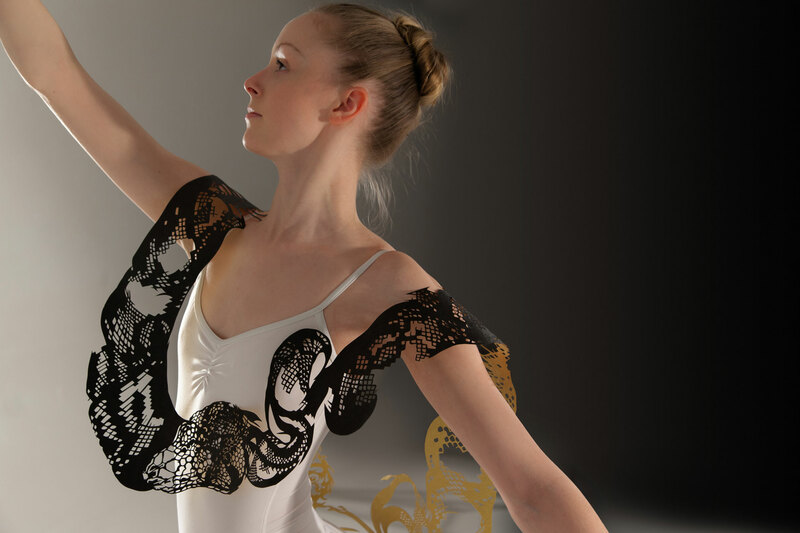 Human Collection: costume designer art from a single sheet of paper. MULTIPLE PERSONAS What does it mean to be human? Is the object made for the use of man or are both made for each other as a part of Nature? 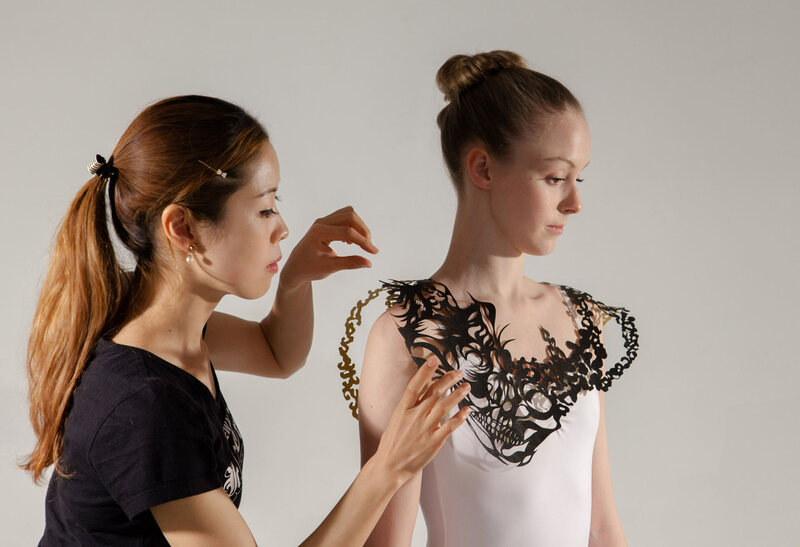 Human Collection: costume designer art from a single sheet of paper. NATURAL KILL Looking at death as a part of life. 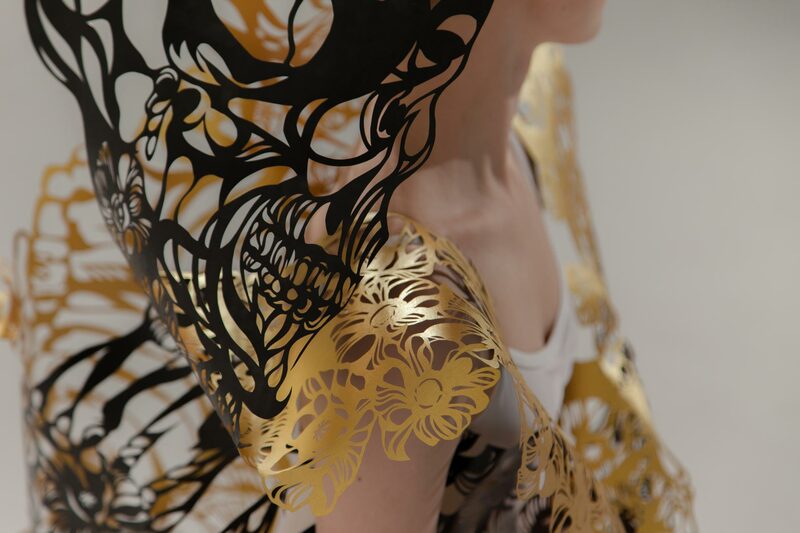 Human Collection: costume designer art from a single sheet of paper. RABBIT ISLAND Inspired by the island of Ookunoshima in Japan, uninhabited for many years only to one day be discovered as an island with only a thriving population of rabbits. Human Collection: costume designer art from a single sheet of paper. HUMAN A ballerina was adorned with the paper garments to demonstrate the flexibility and strength of the material. Human Collection: costume designer art, a single sheet of paper.